It is not known if the Speedway was ever built at Lake Preston or not and if a Speedway meeting was ever held there. The exzact location of the proposed Speedway is unknown. 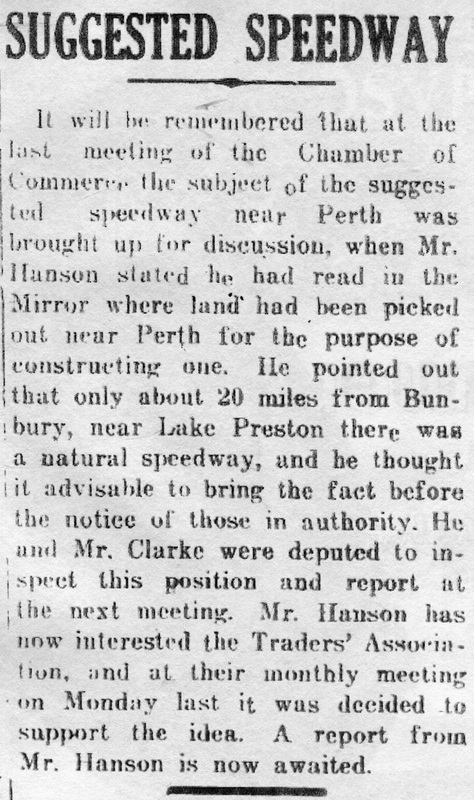 Newspaper reports of the time report the location of the proposed track at twenty miles North of Bunbury, this would place the track at the Southern end of Lake Preston, this would place the location in the Mylup area. 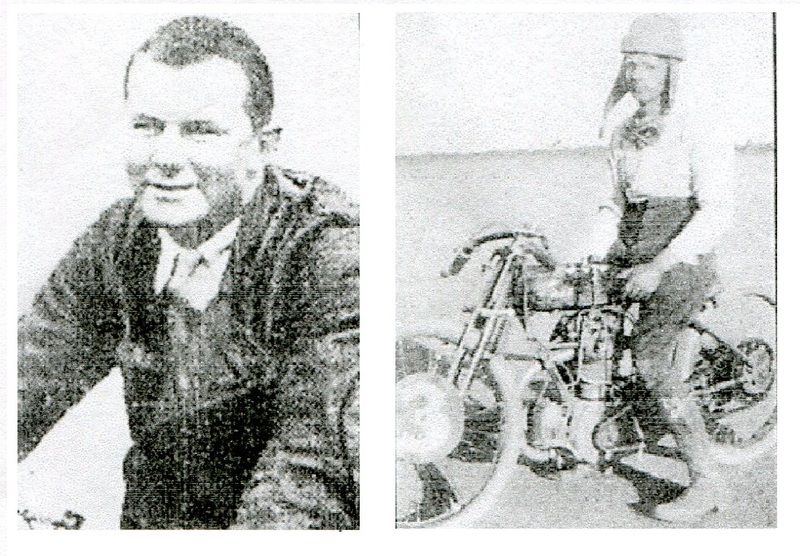 Not many would be familiar with the tragic plane crash at Picton in 1933,that claimed the lifes of two young Bunbury men, Colin Teede and Stan Catlett, but very few would know of the adventurous life of the twenty six year old Stanley Waldo Catlett. Stan was born in 1907, the second son of Mr and Mrs Ernest Waldo Catlett. Catlett Snr was a jeweller and watchmaker, who lived and conducted his business from premises in in Wellington Street roughley were Souths Furniture store is today. Stan served a mechanical apprenticeship and by 1924 - 1925 worked as a mechanic with the Narrogin Trading Co, who at that time had the Ford dealership. His scills in tuning and repairing any type of motor was recognised by the motoring public of the day and his services were always in demand. His obvious love of speed was not only on motorcycles and in motor vehicles, but also in speedboats.The tales of his exploits in scaring the locals on the estuary, from Turkey Point to the Collie River, are still remembered. 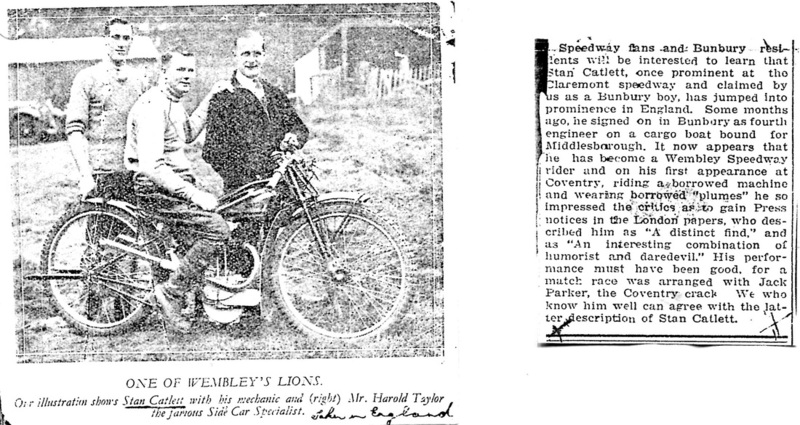 In 1927, after completing a number of successful seasons on the Speedway tracks in Perth, he decided to compete on the lucrative Speedway scene in Great Britain, to defray costs, he joined a tramp steamer as forth engineer and after a four month voyage reached Liverpool, He approached the top English club, Wembley, and with borrowed riding gear and riding an unfamiliar club bike, he made his debut, and was soon competing on the English club circuits and adding adding to his reputation as one of the top Australian riders to enter the English speedway circuit. Racing was conducted over four to five nights a week, consequently prize money earned by top riders amounted to film star status. Catlett was appointed captain of the Wembley side and at the close of the English season returned to Australia with fellow Aussie riders and the English team for a test series in all major cities. The Perth press made much of Catlett's return as a passenger occupying a stateroom on the P&O liner, in contrast to his departure on a cargo boat working for his passage. Bunbury folk were out in force to welcome Catlett on his return from England and of course he arrived in style, flying into town in a borrowed aircraft , accompanied by the captain of the English team Jack Ormiston as well as Catlett's Wembley team mate. Catlett was enjoying another spectacular season when he had one of the worst crashes in his career badly breaking a leg in two places. After seven weeks of convalescing he finished the season and returned home to Bunbury with funds in his pocket and the desire to open his own business. Stan continued earning top money as a star attraction at the Claremont speedway, but he must have realised the need to consolidate his life and a decision was made to open his own garage and workshop. he was assisted in his endeavour with the help of the Ramsay family, who were farmers from in the Capel district. They secured land on the South East corner of Stirling and Spencer street and built a garage and workshop for Stan, who had secured the morris dealership for the district. The busy period of setting up the business to open in December of 1933 saw Stan off to Perth to secure stock for the dealership and to enjoy a few days break before the big opening day. 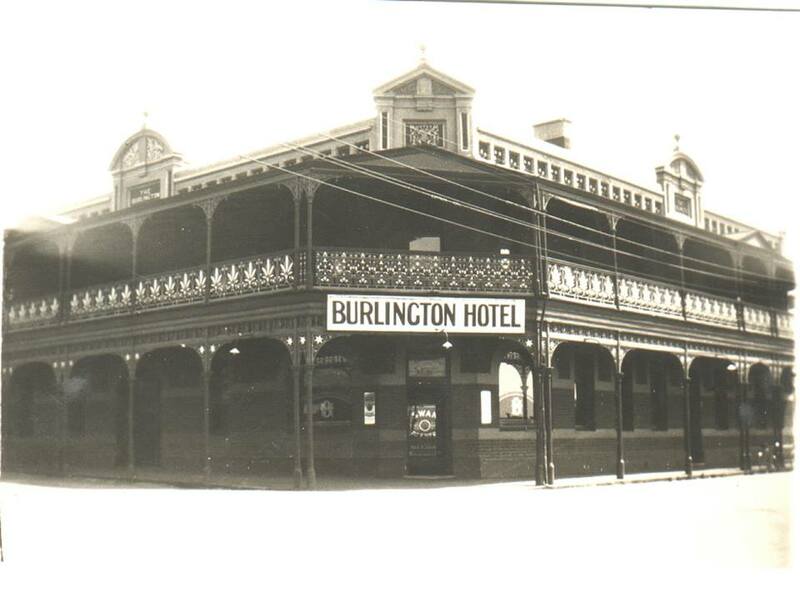 Deciding that a good way to relax and enjoy the freedom of the air was to hire an aircraft from the Royal Aero Club (he was a member) and apparently whithout thought to the consequences and without permission decided on a flying trip to Bunbury. that fateful decision was made on the 29th of November 1933 and the rest is history. The photo above of Jane Motors was taken in 1937, this is the original building that was built for Catlett dealership. currentley in 2011 the building has been replaced with the two story complex that is home for Hot FM. The Catlett Story was made possible with the kind assistance of his nephew, Mr Frank Handley, and the family with newspaper cuttings and the family photo's: Ray Repocholi. The Bunbury Showgrounds was originally owned by the Wellington Agriculture Society, The Bunbury council took it over and remaned it the Forrest Memorial Oval, some time later it was renamed to what we know it as today as Hands Oval. On a race meeting on the 2nd of November 1930, Charles Wear crashed his machine heavily and was rushed to hospital but unfortunatly lost his battle for life the following day. In June of 1931 the Back Beach of Bunbury was turned into a race track for speed trials, the first event was a flying quarter mile which was won by Ossi Cranston in his A model Ford special at a speed of 88.23mph from a Desoto and a Austin Special. The standing quarter mile handycap race Ossi found his handycap too great to overcome to win but still set fastest time. Ossi went on to complete the day by winning the four and five mile handycap races along the Back Beach. 1931 Ossi Cranston in his A model Ford special. Photo: unknown. It has been reported that a Hill Climb event was held in Bunbury at an unknown location in 1931. The winner of that event was Ossie Cranston in his Ford A Special, the distance of the hill climb is unknown. 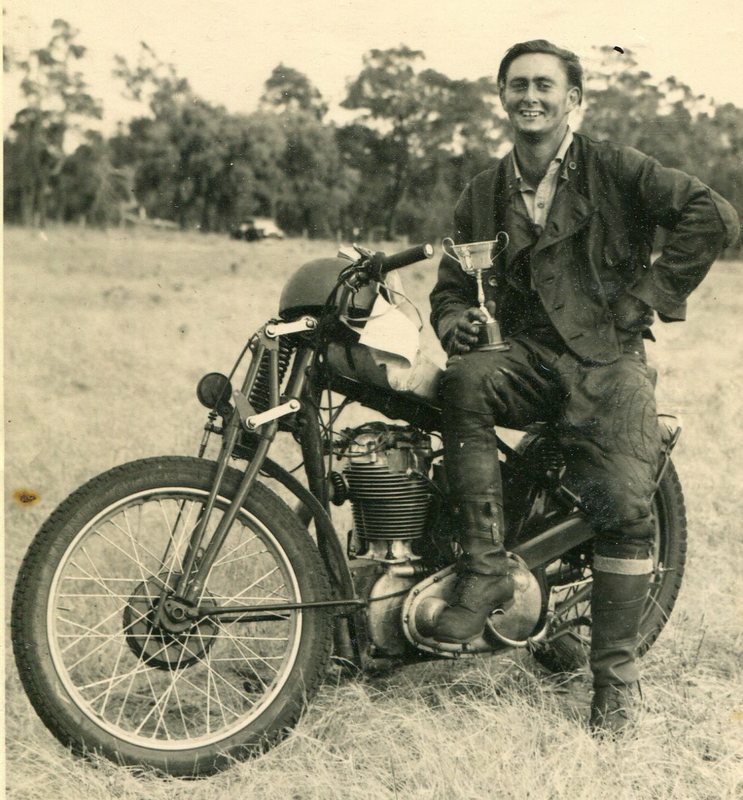 After the second world war a man by the name of Colin Campbel was instrumental in the planning and building of many of the Bunbury Motor Cycle Clubs scramble tracks. 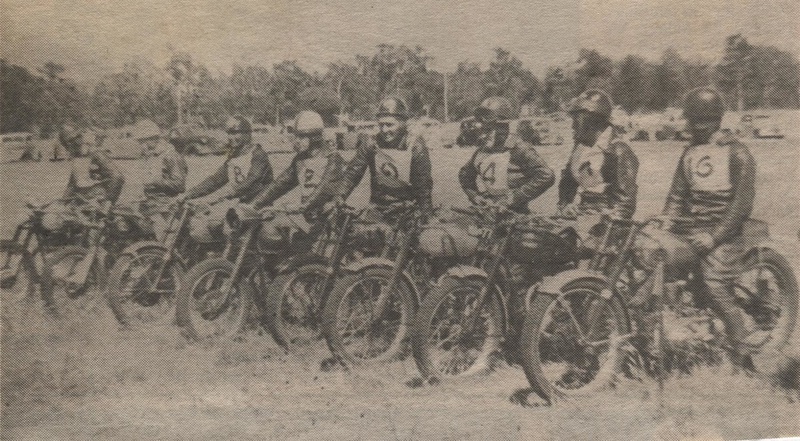 At the time the motorcycle club had many members that had come to Australia as Ten Pound Poms, with this a lot of English track names were used, thus the Bunbury Withers track was called Hawkstone Park. Right: A very happy Colin Campbel with his trophy for the days wins when the newly formed Bunbury Motor Cycle club held its scramble event at the Moorlands circuit. The mid forty's saw the construction of a 440 yard flat oval motorcycle and sidecar track in Moorelands opposite the old Picton school, the track was oval in shape and covered with cinders (a by product from steam engines), the machines were all stripped down road bikes that were ridden to the track. As it was just after the war many families did not have cars so Henderson's bus service ran a shuttle to the track for spectators. Time passed and the flat speedway track was closed and a scramble track was built nearby, weaving amoungs't the trees and through the wet lands, racing continued until the mid fiftee's. Riders of the day included Lieth Cahill, Kieth Sherry, Bill Denning, Rod Thomas, John Nutley, Colin Campbell, Grant Gilmore, Ron Buswell, Bill Oniel, Ray Repocholi, Vic Hough, Bob Dyer, Val Summers, Ross Payne, Doug Cutts and Trevor Whittle. All racing was controlled by the Bunbury Motor Cycle Club. Ray Repocholi cuts up the wetlands. 1947 - 2 riders on Indian Scouts, one with a Bridgetown number plate, the other is Colin Campbell from Bunbury, a very active member of the Bunbury Motor Cycle Club, parked up on a Bunbury street. Photo: unknown. 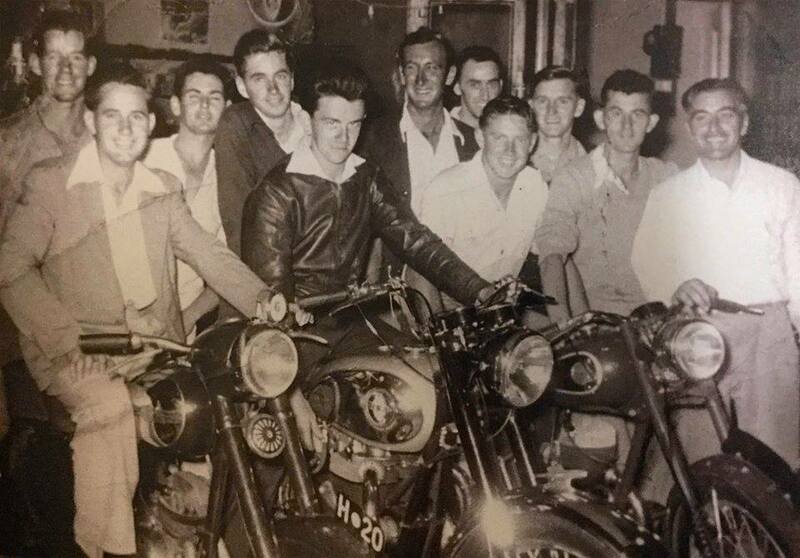 1952: Bunbury Motorcycle Club intertown competition - Bunbury - Collie - Harvey and Manjimup - left Ray Repacholi, Vic Hough, Bob Dyer, Val Summers (Bunbury) Ross Payne (Collie) Doug Cutts (Manjimup) Photo: Ray Repocholi collection. The area is currently used for grazing cattle only but will eventually be sub divided for housing once town planning is approved. It has been reported that Motorcycle racing was also conducted at the recreation grounds off Ocean Drive in the early fifties, The motorcycles raced on the exzisting cycle track. At the showrooms of Walton and Gardiners Holden dealership in Spencer Street an idea was formed to hold a car trial. this took place on a Sunday afternoon in 1954 at an open cut mine site at Allanson near Collie. this proved to be very successful with Pop Hudson, his son David, Jim Renfree, Ernie Stevens and many more competing, many family members and friends went along as onlookers and had such a good time that a meeting was called and the Bunbury Car Club came into being, it wasn't long before people like Syd Hudson, Neville Hyder, Vern Karlson, Colin Resta,Jimmy Kingswood, Jim Wilson and many more joined the club. Most cars involved were FX and FJ Holden's until a young fellow named Teede arrived in a Volkswagon to win the time trial come hill climb along the Collie Pipe line,as the choice of car diversified to many other manufactures, so did the type of event, this included six and twelve hour trials taking them as far afield as Narrogin, Esperance and out past Balladonia in the east. 1954 saw the team of Ted Walton and Jack Gardiner enter the Red Ex around Australia trial as Bunbury Car Club members. In a short time the clubs activities were so widely publicised that the organisers of the 1955 Red Ex trial requested assistance from the Bunbury Car Club to man check points in West Australia. As Walton and Gardiner were competing in the trial other members such as Graeme Hurst, Neville Hyder, Syd Hudson, Bert Renfreeand his two sons Edger and Jim, Ted Johnston and Ron Isles set off for Broome and Port Hedland to officiate at check points. 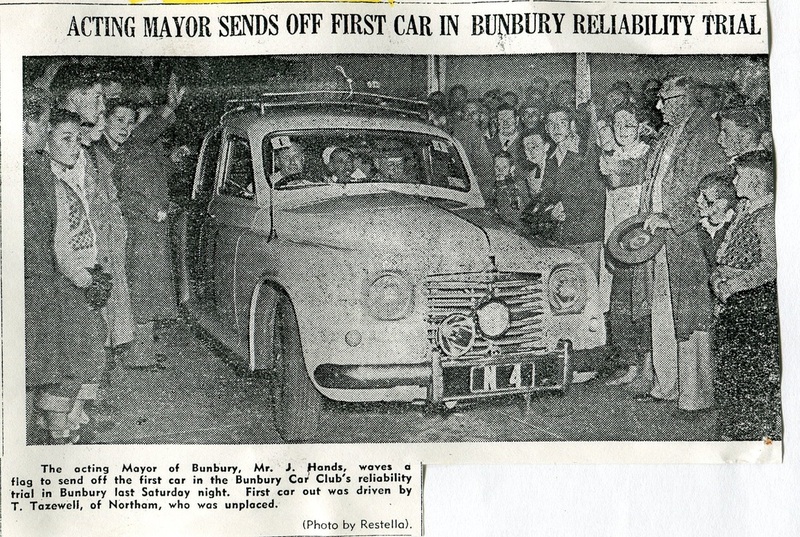 The Bunbury Car Club had put forward the offer to go anyware in West Australia to assist the ASCC, there reason being that they wanted Bunbury included in the 1956 Red Ex around Australia Trial. 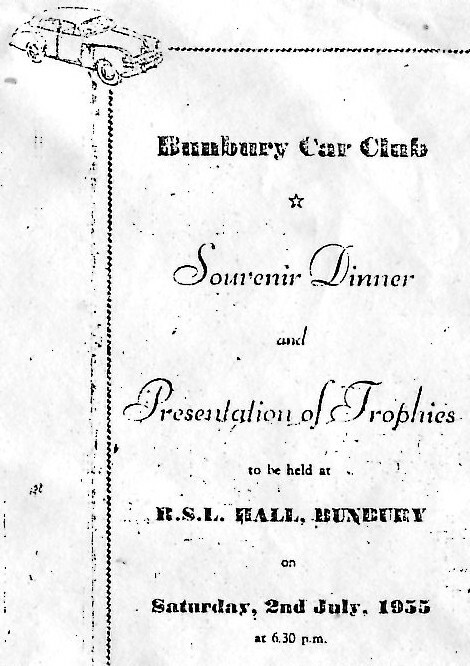 The Bunbury Car Club held it first club Presentation Dinner, honoring its out standing members on the 2nd of July 1954 at the Bunbury RSL Hall. 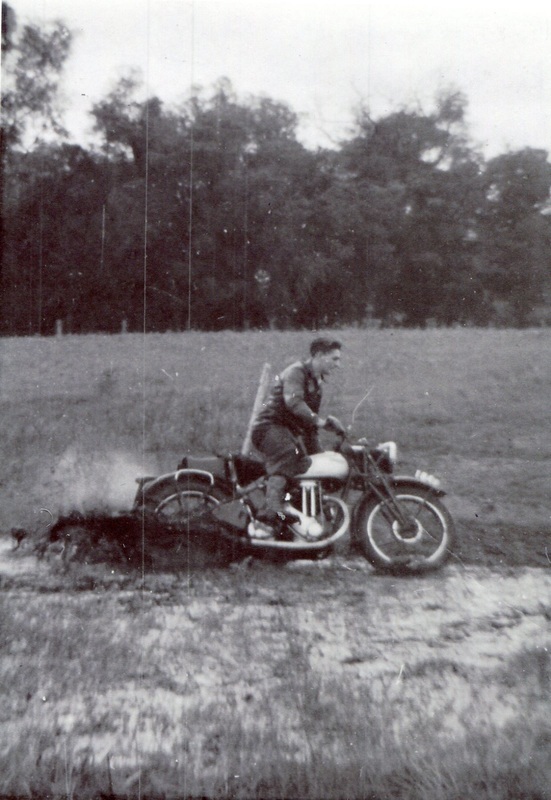 The Bunbury Motor Cycle Club built a scramble track on Parade Road in 1954. the track ran between the storm water drain and Parade Road Withers. The scramble track is nothing more than a few humps in the ground today, all of the area is public open space on the edge of Hay Park, Bunbury's major sporting venue. 1955 - Fred Himing - Ken Hastie - Neil Clifton - Johnny Travis - Stan Rogers - Quang Warrick - Ted Bailey - Colin Mitchell - Trevor Dyer - John Kirkpatrick - Fred Harding. Photo: Ken Hastie. Fred Harding was the owner of a Motor Cycle shop in Bunbury on the corner of Spencer Street and Stone Street, Fred was also the president of the Bunbury Motorcycle Club around 1955.